President Trump gave his first joint address to the members of the House and Senate on Tuesday. 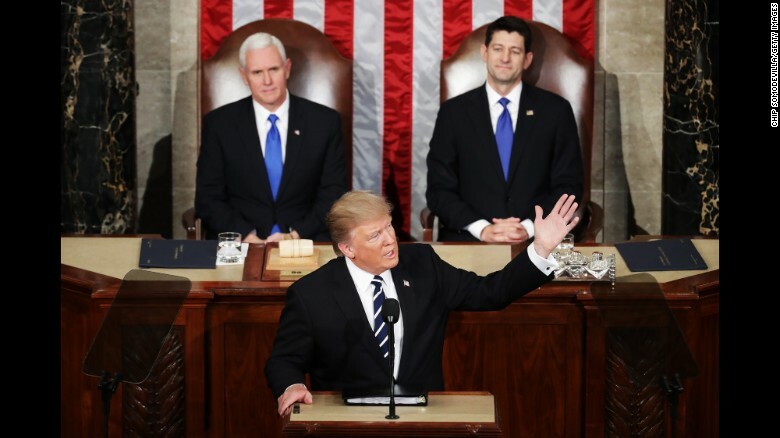 The speech has been widely seen as his best to date, but views vary widely on how much importance should be placed on his ability to deliver it. Media on the right are saying that this was the moment he became presidential and is the best speech they've heard, while media on the left have been claiming that the speech was negative and others said it didn't contain real policy. See other news featured by AllSides such as Excluded from WH Briefing, Understanding Steve Bannon, Sessions and the Russian Ambassador and the latest AllSides News. "While Trump garnered enthusiastic applause Tuesday from the Republican side of the aisle for marquee items such as replacing former president Barack Obama’s health-care law and retooling the tax code, major differences remain within the GOP on the specifics of how to move forward. Trump’s speech touched on his plans to overhaul the nation’s health-care system and tax code, but it was short on specifics and heavy on lofty prose. Struggling to steer a bitterly divided nation with his job-approval ratings at historic lows, Trump effectively pleaded with the American people to give him a chance and to imagine what could be achieved during his presidency. 'We are one people, with one destiny,' Trump said quietly near the end. 'The time for small thinking is over. The time for trivial fights is behind us. We just need the courage to share the dreams that fill our hearts.'" Trump's speech: How'd he do? "President Donald Trump delivered what many hoped for: a speech calling for unity with Democrats -- a key departure after antagonizing them during his first month in office. In the very first sentences of his speech, Trump finally condemned anti-Semitic attacks in recent weeks, along with the fatal shooting of an Indian man at a Kansas bar. This was a crucial move from a president who has been dodging acknowledgment of the growing number of hate crimes. The commander-in-chief's straightforward presentation was also a departure from his usual bombastic style. Trump stayed cool when Democrats stayed seated as Republicans rose to clap, or gave a thumbs down to his proposed Obamacare repeal. He largely refrained from his habit of rehashing the election and the rise of the coalition that brought him to power." "Let’s not kid ourselves. That was a super speech. Not flowery, except that in parts it was eloquent without being flowery. Not poetry, except that it was poetry. It was a blast from the heart of the heart of America. It was as if Mr. Trump did not even have to use words. His sincerity and power in touching what Americans want to hear was beyond prose. The days of being pushed around — especially by the worst elements in our own country — are over. We’re proud to be Americans. We have nothing to be ashamed of, so we’re going to stop being ashamed. The world is a dangerous place, so we’re going to rearm. There are people out there who want to hurt us badly. It’s Trump’s priority to keep them far away. The streets of America have roaming gangs of savage beasts. Trump will save the urban Americans by locking up the savage beasts."